The recipient of this award, now in its 4th year, is Ms. Cindy Marin-Martinez. 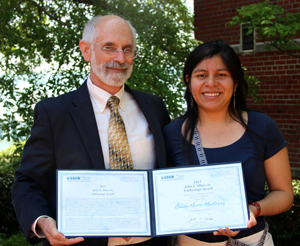 Cindy joined the VIMS community as a Master’s student in 2013 on a Fulbright Scholarship. Her thesis research continues an interest in the biology of larval fishes that she first gained during undergraduate studies at the University of El Salvador. At VIMS, she will use data from a time series of larval fishes that was started by John Olney in 2007 and that continues today. This study is designed to monitor seasonal and year-to-year changes in the diversity and number of larval fishes entering the York River. In addition to weekly sampling from the Gloucester Point fishing pier, Cindy will correlate patterns of abundance for the dominant species to environmental conditions. She will also study how abundance data from the larval-monitoring program is reflected in the juvenile and adult abundances for commercially, recreationally, and ecologically valuable species.